The concept of rehabilitation provided an essential richness in the conservation philosophy through sustaining buildings life and adapting them to the contemporary use through a vision which looks at the present and future . In Iraq , the existence of historical buildings and the traditional fabric in the cities required the urban development which enhanced the interests of planning and architectural fields especially the building rehabilitation which requires the architectural intervention , and all that led to elaborate the problem of research which is " The confusion in the concepts of monumental, historical and traditional buildings in Iraq, As well as The insufficient knowledge about rehabilitation and the acts related to it through the orientation of conservation in general, And the confusion between the levels of urban conservation and architectural conservation, and the challenges which accompany each of the urban rehabilitation and building rehabilitation in Iraqi reality in particular. And from this problem the research looks to Clarify the concepts of monumental, historical and traditional buildings and the nature of actions which are used to protect and sustain them, As well as Clarify the types of actions that are taken to protect those buildings through the orientations of rehabilitation and clarify the procedures, acts which are classified as policies, strategies and mechanisms. And Clarify the levels of rehabilitation on the urban level, and the architectural level (preserve and rehabilitate the single building) and their challenges in Iraq to find a formula that can solve the gap between the two levels.And to achieve these goals, the research put the theoretical framework and support it with the global experiences, which led to put a default perception represented by " It is possible to activate the rehabilitation of historical and traditional buildings in Iraq at medium scale between the major projects in urban renewal and the rehabilitation of individual building through a pilot projects to a group of buildings (traditional or historical have the connections on the urban level in the traditional fabric ". which provides a possible formula can be applied on the Iraqi reality. And get out the conclusions and recommendations from the research.لقد قدم مفهوم إعادة تأهيل الأبنية إغناءاً أساسياً في فلسفة الحفاظ في العالم من خلال إدامة حياة المعالم وتهيئتها للإستعمال المعاصر ضمن رؤية لاتنظر إلى الماضي فحسب بل على رؤية الحاضر والمستقبل . و في العراق فإن وجود الأبنية التاريخية والنسيج التراثي في حواضر المدن و التي تتطلب تطويراً حضرياً عزز من إهتمام المجالات التخطيطية والمعمارية به خاصة في ما يتعلق بإعادة تأهيل الأبنية التي تتطلب التدخل المعماري , و منها تمثلت مشكلة البحث بالمحاور الآتية : - التداخل المعرفي بين مفاهيم الأبنية الآثارية و التاريخية و التراثية في العراق , - عدم كفاية المعرفة عن إعادة التأهيل و ما يرتبط به من أفعال متخصصة ضمن توجهات الحفاظ بشكل عام - فضلاً عن قلة المعرفة بالتحديات التي ترافق كل من إعادة التأهيل الحضري و التأهيل للمبنى المفرد ضمن الواقع العراقي بشكل خاص. و بذلك يسعى البحث لتحقيق الأهداف المتمثلة بـ - ـإيضاح مفاهيم الأبنية الآثارية و التاريخية و التراثية. - إيضاح أنواع الإجراءات المتخذة لحماية تلك الأبنية ضمن إعادة التأهيل و إيضاح تدرج الإجراءات و الأفعال المقسمة بين سياسات و إستراتيجيات و آليات , - مع إيضاح مستويات إعادة التأهيل بين المستوى الحضري و بين مستوى إعادة التأهيل المعماري (إعادة تأهيل الأبنية المفردة) و بيان التحديات المواجهة لها في العراق , و التوصل الى صيغة يمكن ان تحل الهوة بين المستويين. و لتحقيق هذه الأهداف تم طرح الإطار النظري و دعمه بالتجارب العالمية و الذي في ضوئه تم طرح التصور الإفتراضي المتمثل بـ "أمكانية تفعيل أعمال إعادة التأهيل للأبنية التاريخية والتراثية في العراق بمستويات متوسطة بين المشاريع الكبرى في التجديد الحضري و بين إعادة تأهيل مبنى منفرد و ذلك من خلال مشاريع رائدة (Pilot Projects) لمجموعة من الأبنية لها إرتباطات على المستوى الحضري ضمن النسيج التقليدي تراثية كانت ام تاريخية ". و من ثم سعى البحث لتطبيق التصور الإفتراضي على الواقع العراقي. و الخروج بإستنتاجات و توصيات خاصة بالبحث. Architectural Rehabilitation --- Urban Piolt Projects --- Mounemantal Building --- Historical Building --- Traditional Buildings. --- إعادة التأهيل المعماري --- الأبنية الآثارية --- الأبنية التاريخية --- الأبنية التراثية --- إعادة التأهيل الحضري --- إستراتيجية المشروع الرائد الحضري. Temperature inside the vehicle cabin is very important to provide comfortable conditions to the car passengers. Temperature inside the cabin will be increased, when the car is left or parked directly under the sunlight. Experimental studies were performed in Baghdad, Iraq (33.3 oN, 44.4 oE) to investigate the effects of solar radiation on car cabin components (dashboard, steering wheel, seat, and inside air). The test vehicle was oriented to face south to ensure maximum (thermal) sun load on the front windscreen. Six different parking conditions were investigated. A suggested car cover was examined experimentally. The measurements were recorded for clear sky summer days started at 8 A.M. till 5 P.M. Results show that interior air temperature in unshaded parked car reaches 70oC and dashboard temperature can approach 100 oC. While, cardboard car shade inside the car not reduce the air temperature inside it. Suggested car cover with 1 cm part-down side windows reduced temperature of cabin components by 70 % in average compare to the base case.تعتبر درجة الحرارة داخل مقصورة السيارة ضرورية لتوفير ظروف مريحة للركاب داخلها. تزداد درجة الحرارة داخل السيارة عندما تُترك متوقفة مباشرة تحت أشعة الشمس. أجريت دراسة تجريبية في مدينة بغداد، العراق (خط طول 44 وخط عرض 33) لمعرف تأثير الإشعاع الشمسي الساقط على مكونات السيارة الداخلية (لوحة القيادة، المقود، المقعد، الهواء الداخلي). وضعت سيارة الإختبار مواجهة لجهة الجنوب لضمان أقصى قدر من الإشعاع الشمسي الساقط على الزجاج الأمامي للسيارة وكذلك للحصول على أكبر حمل حراري داخل المقصورة.أختبرت ستة حالات مختلفة للسيارة المتوقفة. سُجلت القياسات لأيام الصيف والسماء صافية من الساعة 8 صباحاً وحتى الخامسة بعد الظهر. بينت النتائج أن درجة حرارة الهواء الداخلي في السيارة المتوقفة غير المظللة يصل 70 درجة مئوية وإقتربت درجة حرارة لوحة القيادة من 100 درجة مئوية. أما عند وضع واقية شمسية المصنعة من ورق الالمنيوم من داخل السيارة فإنها لم تقلل من درجة حرارة الهواء داخل المقصورة. وعند إستعمال غطاء السيارة المقترح مع فتح الزجاج الجانبي 1 سم، فإنه ساهم في خفض درجة حرارة مكونات المقصورة بنسبة 70٪ مقارنة إلى الحالة الأساسية (سيارة مجردة وبدون أي غطاء). automobile cabin --- temperature distribution --- thermal comfort --- greenhouse problem. --- مقصورة السيارة، توزيع درجات الحرارة، الراحة الحرارية، مشكلة الاحتباس الحراري. 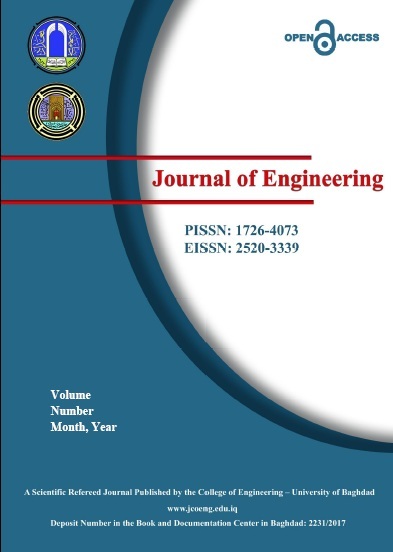 In this paper, effective slab width for the composite beams is investigated with special emphasis on the effect of web openings. A three dimensional finite element analysis, by using finite element code ANSYS, is employed to investigate shear lag phenomenon and the resulting effective slab width adopted in the classical T-beam approach. According to case studies and comparison with limitations and rules stipulated by different standards and codes of practice it is found that web openings presence and panel proportion are the most critical factors affecting effective slab width, whereas concrete slab thickness and steel beam depth are less significant. The presence of web opening reduces effective slab width by about 21%. Concentrated load produces smaller effective slab width when compared with uniformly distributed and line loads. Generally, standard codes of practice overestimate effective slab width for concentrated load effect, while underestimate effective slab width for uniformly distributed and line load effect. Based on the data available, sets of empirical equations are developed to estimate the effective slab width in the composite beams with web openings to be used in the classical T-beam approach taking into account the key parameters investigated.تم في هذا البحث اجراء دراسة تاثير وجود الفتحات في وترة الروافد المركبة من الفولاذ والخرسانة على العرض الفعال للشفة الخرسانية. تم عمل نماذج ثلاثية الابعاد بطريقة العناصر المحددة, باستعمال برنامج التحليل الجاهز ANSYS, للتحقق من ظاهرة تخلف القص والعرض الفعال للشفة الخرسانية الناتج عنها. بينت نتائج هذه الدراسة والمقارنة مع متطلبات ومحددات المراجع والمدونات القياسية ان تاثير وجود فتحات في وترة الروافد الفولاذية ونسبة ابعاد البلاطة الخرسانية هي اهم العوامل المؤثرة على العرض الفعال للشفة الخرسانية وبدرجة اقل يؤثر سمك البلاطة الخرسانية وعمق الرافدة الفولاذية. ان وجود فتحات في وترة الروافد الفولاذية يقلل العرض الفعال بمقدار 21% وان العرض الفعال للشفة الخرسانية بسبب الاحمال المركزة هو اقل مما في حالة الاحمال المنتظمة او الاحمال الخطية. وبشكل عام, فان المدونات القياسية تبالغ في تقدير العرض الفعال الناتج عن الاحمال المركزة وتقلل من تقديره في حالة الاحمال المنتظمة او الاحمال الخطية. واستنادا الى البيانات المتوفرة تم اقتراح علاقات رياضية مبسطة تساعد المصمم على احتساب العرض الفعال للبلاطة في العتبات المركبة ذات الفتحات بصورة مباشرة من خلال بعض المتغيرات التي تمت دراستها. Experimental research was carried out to investigate the performance of CFRP wrapping jackets used for retrofitting twelve square reinforced concrete (CR) column specimens damaged by exposure to fire flame, at different temperatures of 300, 500 and 700ºC, except for two specimens that were not burned. The specimens were then loaded axially till failure after gradual or sudden cooling. The specimens were divided into two groups containing two main reinforcement ratios, ρ= 0.0314 and ρ= 0.0542. This was followed by the retrofitting procedure that included wrapping all the specimens with two layers of CFRP fabric sheets. The test results of the retrofitted specimens showed that the fire damaged RC column specimens can be retrofitted efficiently by using CFRP wrap jackets, as they provided good confinement of the damaged concrete core. Also, the ultimate load capacity of each retrofitted specimen was increased compared to that before retrofitting by about 16, 34 and 44% for the specimens burned at 300, 500 and 700ºC respectively, and cooled gradually, whereas this increase was 44% and 111% for the specimens subjected to burning temperatures of 500 and 700ºC, respectively, but cooled suddenly. This ability of each column specimen to absorb energy before and after retrofitting was also improved. The average improvement in modulus of toughness before and after retrofitting was 8% for the specimens not exposed to fire flame and 10, 100, 250% for the specimens exposed to 300, 500 and 700ºC respectively.بحث عملي اجري لغرض فحص قابلية استخدام لف سترة من CFRP لتطويق اعمدة استخدم لاعادة تاهيل اثنا عشر عمود خرساني مسلح مقطعه العرضي مربع،والتي تضررت نتيجة التعرض الى لهب بدرجات حرارة عالية مختلفة تصل الى 300, 500 و 700مº , عدا نموذجين لم يتم حرقهما. ثم تم تحميلها محوريا لحد الفشل بعد تبريدها بصورة سريعة او تدريجية. تم تقسيم النماذج الى مجموعتين حسب محتوى الحديد الطولي ρ= 0.0314 and ρ= 0.0542. . بعده تم اجراء خطوات اعادة التاهيل, والتي تضمنت لف جميع النماذج بطبقتين من CFRP . اظهرت النتائج ان النماذج المحروقة يمكن بكفاءة عالية اعادة تاهيلها باستخدام CFRP لانها توفر تقييد جيد للخرسانة في وسط العمود. كذلك زيادة في تحمل الاعمدة بحوالي 16, 34 و 44% للنماذج المحروقة بدرجة 300, 500 و 700مº والمبردة تدريجا على التوالي بينما كانت 44و 111% للنماذج المحروقة في 500و 700م ولكن المبردة فجائيا . قابلية امتصاص الطاقة لكل نموذج بعد و قبل اعادة التاهيل اظهرت ارتفاع بمقدار 8% للنماذج غير المحروقة بينما كانت 10, 100و 250% للنماذجد المحروقة في 300, 500 و 700مº . A two time step stochastic multi-variables multi-sites hydrological data forecasting model was developed and verified using a case study. The philosophy of this model is to use the cross-variables correlations, cross-sites correlations and the two steps time lag correlations simultaneously, for estimating the parameters of the model which then are modified using the mutation process of the genetic algorithm optimization model. The objective function that to be minimized is the Akiake test value. The case study is of four variables and three sites. The variables are the monthly air temperature, humidity, precipitation, and evaporation; the sites are Sulaimania, Chwarta, and Penjwin, which are located north Iraq. The model performance was checked by comparing it's results with the results of six forecasting models developed for the same data by Al-Suhili and khanbilvardi, 2014.The check of the performance of the new developed model was made for three forecasted series for each variable, using the Akaike test which indicates that the developed model is more successful, since it gave the minimum (AIC) values for (91.67 %) of the forecasted series. This indicates that the developed model had improved the forecasting performance. For the rest of cases (8.33%), other models gave the lowest AIC value, however it is slightly lower than that given by the developed model. Moreover the t-test for monthly means comparison between the models indicates that the developed model has the highest percent of succeed (100%).تم في هذا البحث اشتقاق نموذج تنبأ بالبيانات الهيدرولوجية متعدد المواقع متعدد المتغيرات ويعتمد على خطوتين زمنيتين وتم برهنته باستخدام حالة دراسية. ان فلسفة هذا النموذج تعتمد على استخدام معاملات الأرتباط بين المتغيراتوبين المواقع ومعاملات الأرتباط الزمني لخطوتين زمنيتين سابقتين بشكل اني لأيجاد معاملات النموذج ومن ثم يتم تغيير قيمها باستخدام عملية المعايرة الخاصة بتقنبة الجينات الوراثية . كما هو معروف هن تقنية الجينات الوراثية هي تقنية تستخدم لأيجاد القيمة المثلى لدالة الهدف حيث ان الالة المستخدمة هنا والتي يتم ايجاد القيمة الصغرى لهى هي دالة اختبار اكايكي. ان الحالة الدراسية المأخوذة هس لأربع متغيرات في ثلاث مواقع . المتغيرات هي درجة حرارة الهواء والرطوبة والسقيط والتبخر الشهرية والمواقع هي السليمانية وجوارتة وبنجوين التي تقع في شمال العراق. تم مقارنة اداء النموذج مع نتائج ستة نماذج تنبأ ولنفس حالة الدراسة. هذه المقارنة تمت لثلاثة متسلسلات زمنية لكل متغير في كل موقع تم التنبأ بها بستخدام كل من النماذج الستة السابقة والنموذج الجديد وباستخدام الأختبار المشار اليه اعلاه واشارت النتائج بان النموذج الجديد اكثر نجاحا لانه اعطى اقل قيم للأختبار بنسبة 91.76 %. وهذا يدل على ان النموذج الجديد قد حسن عملية التنبأ. forecasting --- multi-sites --- multi-variables --- cross sites correlation --- serial correlation --- cross variables correlations --- hydrology. --- التنبؤ، مواقع متعددة، متغيرات متعددة، ارتباط المواقع المتقاطعة، ارتباط متسلسل، ارتباط المتغيرات المتقاطعة، هيدرولوجي. Iraq depends mainly on Tigris and Euphrates Rivers to provide high percentage of agricultural water use for thousands years. At last years, Iraq is suffering from shortage in water resources due to global climate changes and unfair water politics of the neighboring countries, which affected the future of agriculture plans for irrigation, added to that the lack of developed systems of water management in the irrigation projects and improper allocation of irrigation water, which reduces water use efficiency and lead to losing irrigation water and decreasing in agricultural yield. This study aims at studying the usability of irrigation and leaching scheduling within the irrigating projects and putting a complete annual or seasonal irrigation program as a solution for the scarcity of irrigation water, the increase of irrigation efficiency, lessening the salinity in the projects and preparing an integral irrigation calendar through field measurements of soil physical properties and chemical for project selected and compared to the results of the irrigation scheduling and leaching with what is proposed by the designers. The process is accomplished by using a computer program which was designed by Water Resources Department at the University of Baghdad, with some modification to generalize it and made it applicable to various climatic zone and different soil types. Study area represented by large project located at the Tigris River, and this project was (Al-Amara) irrigation project. Sufficient samples of project's soil were collected so as to identify soil physical and chemical properties and the salinity of soil and water as well as identifying the agrarian cycles virtually applied to this project. Finally, a comparison was conducted between the calculated water quantities and the suggested ones by the designers. The research results showed that using this kind of scheduling (previously prepared irrigation and leaching scheduling) with its properties which made it applicable requires an intense care when using the plant distribution pattern, the agrarian cycle, its agrarian areas and agricultural intensity within all climatic regions. Also, it was found that this program was an instrumental tool for providing water if the plant distribution pattern was well-selected.يعتمد العراق على نهري دجلة والفرات في توفير نسبة كبيره من الاحتياجات المائية للإغراض الزراعية منذ آلاف السنين . إلا انه في السنوات الأخيرة أصبح يعاني من شحه في موارده المائية بسبب التغيرات المناخية العالمية والسياسات المائية الجائرة لدول الجوار مما اثر على الخطط الزراعية المستقبلية . أضافه إلى ذلك ضعف طرق إدارة المياه في المشاريع الاروائيه وتوزيع مياه الري بصورة غير فعاله مما قلل من كفاءة استخدام المياه والذي أدى إلى هدر في مياه الري ونقص في الإنتاج . تهدف هذه الدراسة إلى دراسة إمكانية استخدام جدولة الري والغسيل ضمن المشاريع الاروائيه ووضع برنامج إروائي سنوي أو موسمي متكامل كحل لشحه مياه الري وزيادة كفاءة الري وتقليل الملوحة في المشاريع وإعداد تقويم إروائي متكامل وذلك من خلال قياسات حقلية لخواص التربة الفيزيائية والكيمائية للمشاريع المختارة ومقارنه نتائج جدولة الري والغسيل مع ما هو مقترح من المصممين. تتم هذه العملية باستخدام برنامج حاسوبي تم انشاؤة وإعداده وتتطويرة في قسم هندسة الموارد المائية في جامعه بغداد مع بعض التعديلات للارتقاء به نحو العمومية وجعله قابل للتطبيق في المناطق المناخية المختلفة ولأنواع مختلفة من الترب. تم اختيار مشروع ري العمارة كمنطقة للدراسة وتم جمع العينات الوافية للمشروع لمعرفة خواصه الفيزيائية والكيميائية ونسبة الملوحة في التربة ومياه الري أضافه إلى ذلك تم معرفة الدورة الزراعية المطبقة فعليا في المشاريع. وأخيرا تم إجراء مقارنة بين كميات المياه المحسوبة وكميات المياه المقترحة من قبل المصممين ومن خلال نتائج البحث أظهرت إن استخدام هكذا نوع من الجدولة (جدولة الري والغسيل المعدة مسبقا) بخصائصه تجعله قابل للتطبيق, والذي يتطلب عناية شديدة عند استخدام نمط توزيع النباتات والدورة الزراعية والكثافة الزراعية, كما وجد إن هذا البرنامج أداة مفيدة لتوفير المياه إذا ما أحسن اختيار النباتات ونمط توزيعها. irrigation scheduling --- leaching scheduling --- percentage of maximum root depth --- salinity --- water resources dept. program --- water budget --- Amara irrigation project. --- ألجدوله الاروائيه --- جدوله الغسيل --- النسبة المئوية لأطول جذر --- الملوحة --- البرنامج الخاص بقسم الموارد المائية --- الموازنة المائية --- مشروع ري العمارة. Unsaturated soil can raise many geotechnical problems upon wetting and drying resulting in swelling upon wetting and collapsing (shrinkage) in drying and changing in the soil shear strength. The classical principles of saturated soil are often not suitable in explaining these phenomena. In this study, expansive soil (bentonite and sand) were tested in different water contents and dry unit weight chosen from the compaction curve to examine the effect of water content change on soil properties (swelling pressure, expansion index, shear strength (soil cohesion) and soil suction by the filter paper method). The physical properties of these soils were studied by conducting series of tests in laboratory. Fitting methods were applied to obtain the whole curve of the SWRC measured by the filter paper method with the aid of the (Soil Vision) program. The study reveals that the initial soil conditions (water content and dry unit weight) affect the soil cohesion, soil suction and soil swelling, where all these parameters marginally decrease with the increase in soil water content especially on the wet side of optimum.التربه غير المشبعة يمكن ان تثير العديد من المشاكل تحت تاثير الترطيب و التجفيف مسببة الانتفاخ تحت تاثير الترطيب و الانكماش تحت تاثير التجفيف وتغيير في مقاومة القص للتربه. المبادئ الاساية للترب المشبعة هي عادة غير مناسبة في تفسير مثل هذه الظواهر. في هذه الدراسة, التربة الانتفاخية من (البنتونايت و الرمل) تمت دراستها في محتوى مائي و كثافة اوليه مختلفة من منحني الرص المختبري لدراسة تاثير تغير المحتوى المائي على خصائص التربة (الضغط الانتفاخي, معدل الانتفاخ,مقاومة القص (تماسكية التربة) و اجهاد المص للتربة بطريقة ورق الترشيح). الخصائص الفيزيائية للتربة تمت دراستها بالاستعانة بالعديد من الفحوص المختبريه. تم استخدام المعادلات التكميلية لايجاد المنحني الكامل للعلاقة بين المحتوى المائي و اجهاد المص في التربه بالاستعانة ببرنامج (Soil Vision). بينت الدراسة بان ظروف التربة الابتدائية (المحتوى المائي و الكثافة الاوليه) تؤثر على تماسكية التربة و انتفاخيتها و اجهاد المص فيها حيث ان هذه الخصائص الثلاثة تقل بشكل كبير بزيادة المحتوى المائي الابتدائي خاصة على الجهة الرطبة من منحني الرص المختبري. Gypseous soils are distributed in many regions in the world including Iraq, which cover more than (31%) of the surface area of the country. Existence of these soils, always with high gypsum content, caused difficult problems to the buildings and strategic projects due to dissolution and leaching of the gypsum caused by the action of water flow through soil mass. For the study, the gypseous soil was brought from Bahr Al-Najaf, Al-Najaf Governorate which is located in the middle of Iraq. The model pile was embedded in gypseous soil with 42% gypsum content. Compression axial model pile load tests have been carried out for model pile embedded in gypseous soil at initial degree of saturation of (7%) before and after soil saturation. Several criteria have been used to calculate the bearing capacity of the model bored pile through the results of the pile load tests. It was found that Shen's method gave almost an acceptable result for all model pile load tests. Large draw down in bearing capacity was observed when model pile has been loaded after it was subjected to soaking for (24) hours because of loss of cementing action of gypsum by wetting.تتوزع التربة الجبسية في العديد من المناطق في العالم بما في ذلك العراق ، والتي تغطي اكثر من 31% من مساحة البلاد. ان وجود هذه التربة بمحتوى جبس عالي ، يتسبب بمشاكل مختلفة للمباني و المشاريع الاستراتيجية نتيجة انحلال الجبس الناجم عن تسرب المياه من خلال كتلة التربة . التربة الجبسية التي تم اعتمادها في هذا البحث أحضرت من منطقة بحر النجف في محافظة النجف. نفذة ركيزة الحفر في تربة جبسية بمحتوى جبس يقارب ال 42 ٪ وقد أجريت اختبارات حمل الأنضغاط المحوري للركيزة المدفونة في تربة جبسية بدرجة من التشبع الأولي( 7 ٪) قبل وبعد تشبع التربة. في هذه الدراسة تم استخدام عدة معايير مختلفة لتقييم قدرة تحمل ركيزة الحفر من خلال استخدام نتائج التي حصلت من فحص الركيزة. وقد وجد أن طريقة شن كادت أن تعطي نتيجة مقبولة لجميع اختبارات الحمل لنموذج الركيزة المستخدمة في هذا البحث. هبوط كبير تم ملاحظته في قابلية تحمل الركائز عند تحميلها بعد تعرضها الى الغمر بالماء لمدة 24 ساعة وذلك نتيجة لذوبان مادة الجبس الذي يعمل مادة رابطة بين حبيبات التربة. The objective of this study is to investigate the application of advanced oxidation processes (AOPs) in the treatment of wastewater contaminated with furfural. The AOPs investigated is the homogeneous photo-Fenton (UV/H2O2/Fe+2) process. The experiments were conducted by using cylindrical stainless steel batch photo-reactor. The influence of different variables: initial concentration of H2O2 (300-1300mg/L), Fe+2(20-70mg/L), pH(2-7) and initial concentration of furfural (50-300 mg/L) and their relationship with the mineralization efficiency were studied. Complete mineralization for the system UV/H2O2/Fe+2 was achieved at: initial H2O2 = 1300mg/L, Fe+2 = 30mg/L, pH=3, temperature =30oC and irradiation time of 60 min, for 300mg/L furfural concentration. The results have shown that the oxidation reagent H2O2 plays a very important role in the furfural mineralization.الهدف من هذا البحث دراسة معالجة المياه الملوثة بمادة الفورفورال باستخدام احد طرق الاكسدة المتقدمة(AOPs) . حيث تم استخدام نظام الاكسدة المتجانسة (UV/H2O2/Fe+2, photo-Fenton process). التجارب تم اجرائها باستخدام مفاعل اسطواني مصنوع من الفولاذ المقاوم للصدأ يعمل بنظام الوجبات. تاثيرالمتغيرات المختلفة مثل: التركيز الابتدائي لل H2O2 1300mg/L) (300-و Fe+2(20-70mg/L) وpH (2-7) والتركيز الابتدائي للفورفورال(50-300 mg/L) تم دراستها ودراسة علاقتها مع كفاءة التحلل للفورفورال. بينت التجارب ان التحلل الكامل للفورفورال بتركيز mg/L 003 تم باستخدام H2O2=1300mg/L وFe+2 =30mg/L وبظروف حامضية pH=3 ودرجة حرارة 30oC وبوقت 60 دقيقة . النتائج بينت ان تركيز العامل المؤكسد H2O2 له دور مهم في عملية الاكسدة. Advanced oxidation process --- UV --- Furfural --- Photo-Fenton process --- H2O2. Orthophoto provides a significant alternative capability for the presentation of architectural or archaeological applications. Although orthophoto production from airphotography of high or lower altitudes is considered to be typical, the close range applications for the large-scale survey of statue or art masterpiece or any kind of monuments still contain a lot of interesting issues to be investigated. In this paper a test was carried out for the production of large scale orthophoto of highly curved surface, using a statue constructed of some kind of stones. In this test we use stereo photographs to produce the orthophoto in stead of single photo and DTM, by applying the DLT mathematical relationship as base formula in differential rectification process. The possibilities and the restrictions of the used programs for the extraction of digital surface model & orthophoto production were investigated. The accuracy of the adjusted images using the digital differential rectification package, are checked using 3 check points and the RMSE was computed in 3-dimensions. Conclusions for usefulness and reliability of this test for such special applications were derived.ان الصور ذات الاسقاط العمودي تعتبر احد قابليات الوصف الدقيقة والمهمة في الكثير من التطبيقات وخاصة المعمارية وتطبيقات علم الاثار. فعلى الرغم من ان الصور ذات الاسقاط العمودي المستحصلة عن طريق المسح التصويري الجوي سواء كانت الصور المستخدمة ملتقطة من ارتفاعات عالية او واطئة يمكن ان نعتبرها صور مثالية ، الا ان تطبيقات استحصال الصور ذات الاسقاط العمودي من صور ارضية ذات المدى القريب وبمقياس كبير والملتقطة لاهداف تمثل اي نوع من انواع التماثيل او التحف الفنية (كالقطع الاثارية مثلا) ، لا تزال تحتاج الى الكثير من التجارب والمحاولات الخاصة بمسالة دقة مواقع النقاط على هذه الاهداف. ولهذه الاسباب تم اعداد هذا البحث والمتمثل بانتاج صورة ارضية ذات اسقاط عمودي وبمقياس كبير لهدف يتكون من نوع من انواع التماثيل والمصنوع من احد انواع الاحجار والذي يتميز بسطحه الحاوي على الكثير من المعالم الحادة والكثيرة الانحناءات وذلك من خلال التقاط صورتين للهدف (يمنى ويسرى) من على بعد مناسب للحصول على منطقة تداخل بين الصورتين من اجل الحصول على البعد الثالث. ان الية العمل في هذا البحث اعتمدت على استخدام زوج الصور في انتاج الصورة ذات الاسقاط العمودي بدلا من الطريقة الشائعة والمتمثلة في استخدام صورة واحدة وDTM. حيث تم العمل في هذا البحث من خلال تطبيق الموديل الرياضي للتقويم التفاضلي بالاعتماد على التحويل الخطي المباشر (DLT).